Mordian 7th Regiment: Adeptus Mechanicus - Prometheus Forge Knight (more or less) painted! Adeptus Mechanicus - Prometheus Forge Knight (more or less) painted! The temperatures have started to soar here in sunny Colorado and my painting loft has started heating up significantly - I've been getting a little bit of painting done in the mornings before heading off to work while it's nice and cool however! The rather excellent Prometheus from Blight Wheel Miniatures is now (more or less) complete! All of the painting is done at this point, and I gave it a hit of sealant prior to the waterslide transfer stage. Once those are on I'm scheming on how I want to weather it, I definitely want to add some chipping around the lower leg guards, and perhaps on the knuckles of the power fist. I pulled out the older Knight Errant and snapped a scale shot, the Prometheus is just a tad bigger but essentially identically scaled, which I like. I thoroughly enjoyed building and painting this kit, and will be adding another one or two more once they replenish their stock! I also figured what the heck - may as well drag out the Leviathan Crusader from Dreamforge for another scale shot! Still just applying the base red to it, but I'm well pleased with how it's turning out so far! Very cool. Big models like this are quite scary to start painting aren't they? Looking really good though, and it will fit right in with the rest of your AdMech. What waterslides have you planned for? Really looking forward to seeing how you'll weather it.Chipping sounds good, and I'd also add some grime and soot around all those vents, exhausts, and huge joints. Really cool. Id love to see the look on an opponents face if you brought all three to a gaming table. I'd 2nd manus' s comment about soot and grime round the vents and joints. The grubbier and more ancient looking the better as far as im concerned! Had you ever thought about adding some titan legions style heraldric banners? They make a fantastic set. The red shading is sublime. A visit to Mordian 7th always seems to inspire awe. @Manus: Indeed! It's a little awkward painting these bigger models, that's for sure. A buddy of mine gave me a selection of old school brettonian transfers that have some useful options. @Phil Morris: Indeed! I was considering maybe trying some weathering powders on it (something I've never tried). Definitely needs some soot patterns around the vents and such. @Zab: Absolutely! One thing I've learned while dabbling in weathering is the 'less is more' principle is key. @Jugger: Hah! It does have that vibe! @Dai: To be honest, I enjoyed building and painting the Prometheus more, but I am really looking forward to getting my hands on the Mortis! @Col. Ackland: Thanks very much! The red is a pretty easy process - Dark Flesh, thinned Scab Red over that, liiiiitle bit of Blood Red on the edges, then a Baal Red wash over it all. Simples! That looks amazing. Brilliantly well proportioned with the other models in your range, and a lovely paintjob. Do you think you'll do the fist the same as on your other model? The green really sets off the red in the rest of the paintjob and looks really nice that way. Well, that's looking awesome! Especially love that effect on the lenses. Great job, mate! @KrautScientist: I appreciate it! Can't wait to get it stomping around the table! Nicely done! The BigDaddy and Blight Wheel Titans definitely hearken back to the good old days of Adeptus Titanicus. Can't wait to see how the Dreamforge one turns out. Thanks man! I love the BD/BW knights, I think they really capture the old look and feel too. 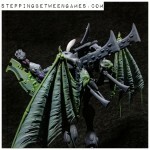 I have an Eldar Wraithknight inbound as well, so we'll see how they tie out scale-wise!